I visited the West Coast Show - a Marty Zinn Expositions show - this past weekend in Costa Mesa, California. Costa Mesa is, or was, a town set on the coast of California in Orange County. Today it is not what I would call a town but, rather a sprawling addition to the contiguous sprawl that comprises all of the greater Los Angeles area from Riverside to Santa Monica to San Clemente. When I lived in Orange County (1957 to 1979) Costa Mesa was just the name of a beach. Oh well things change and so do I. But I have to know how is it that people can tolerate 2 hours in a car on the freeway (any freeway) while trying to travel 25 miles? Is that progress or regress? Enough whining on my part. 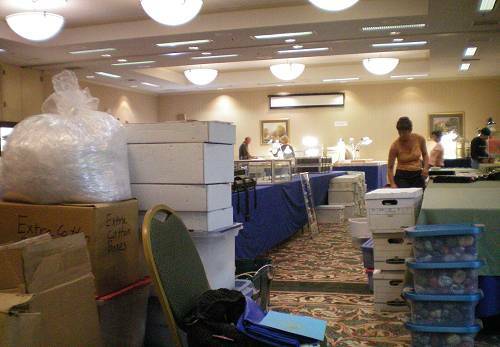 As in recent years I was there for set up day on Thursday and for the first day of the show on Friday only. If you live within 4 hours of Costa Mesa it is well worth the trip as quite a few well known dealers set up at this show. 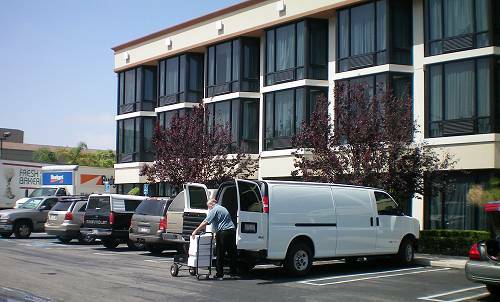 Cal Graeber unloading his van in front of the hotel. 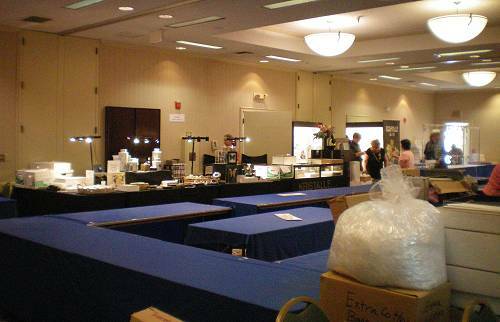 Set up day in the Ball Room. Dona & Wayne Leicht are across the room. are on the far side of the room arranging specimens. 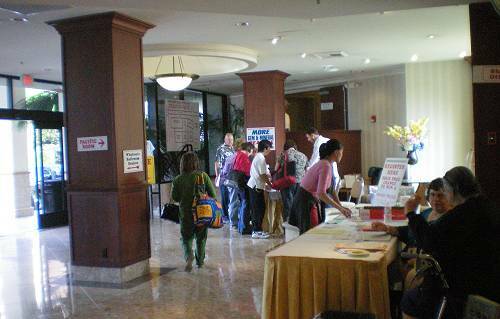 Inside the lobby of Holiday Inn. There were several new things of interest here at the Costa Mesa Show this year. 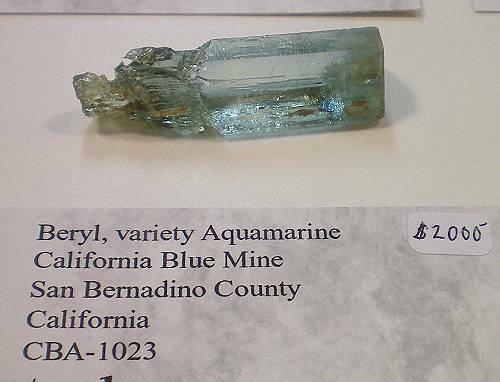 Perhaps the top billing was a new find of aquamarine from the California Blue Mine in San Bernardino County, California. 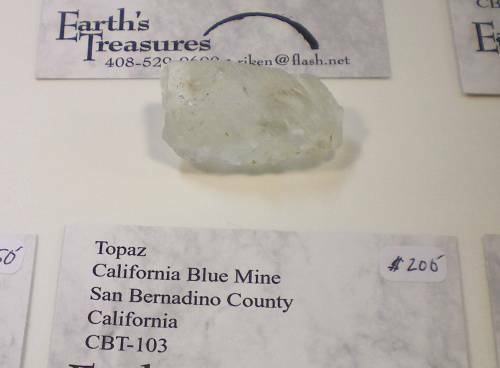 Also found at this new locality is topaz. Rick Kennedy (Earth's Treasures) had the entire supply of this new find and it did not take long for people to hit his room for specimens. The exact locality was not provided unfortunately but will be some day. San Bernardino is larger than many states east of the Mississippi River after all. A 2.5 cm crystal of gem aquamarine from the new find. 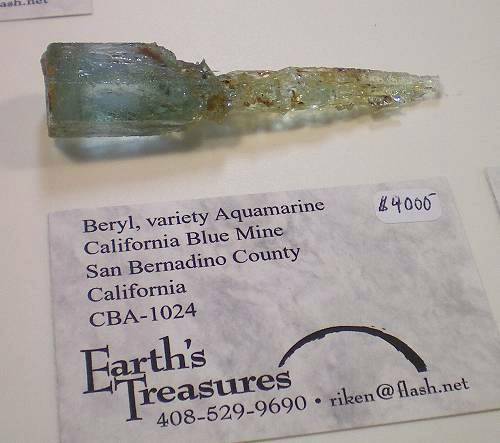 A 4.5 cm scepter crystal of gem aquamarine from the new find. Needs a little cleaning but Cal Graeber got this one and he'll know what to do with it. A 2 cm etched crystal of gemmy, faint blue topaz from the new find. A large part of smaller show like this is visiting with folks. This year I met Dan and Rhonda Kennedy from Paradise, California. This is not too far from Weaverville. They were selling large cabinet specimens at very reasonable prices!! Two Kennedys! Rick on the left and Dan on the right. In the background are Scott Werschky and Santa Cruz collector Jerry Rosenthal. and Scott Wershcky and Joe Kilbaso in the back. Benny Fenn, who specializes in Mexican minerals, had an attractive new find of stalactitic calcite with a frosting of dark brown goethite from Charcas, San Luis Potosi, Mexico. This is the same locality that produces the myriad fine specimens of danburite. The natural amber color of the calcite provides a striking contrast to the dark brown goethite. He had 7 or 8 of these in all and I was happy to get one for the web update as they sold out quickly. Brazilian dealer Luis Menezes was at the show as usual with a few new things from Brazil. 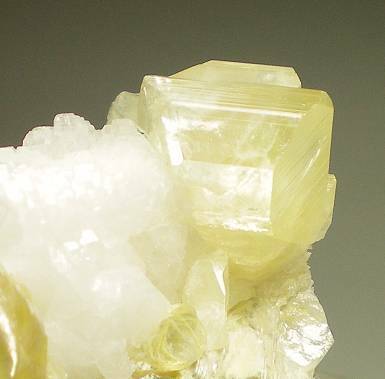 Of interest were some fine specimens of muscovite on albite from the Xanda mine, Virgem da Lapa, Minas Gerias, Brazil. 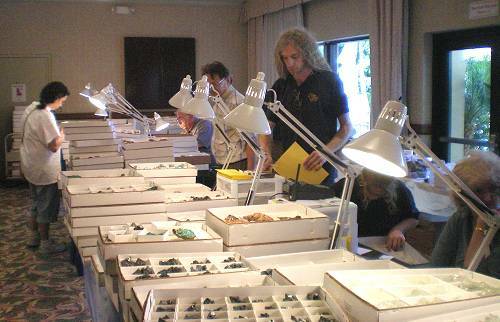 He also has some newly collected crystals of montebrasite as singles and matrix pieces. He had some of these last year from the same place but the quality seemed a bit better this year. Montebrasite is closely related to amblygonite differing only in the replacement of aluminum (mont.) versus sodium (amblyg.). 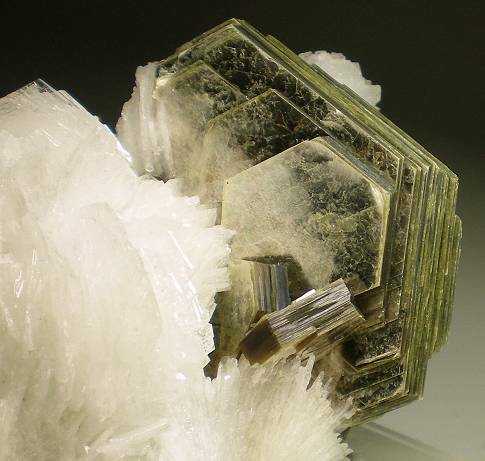 A 1.5 cm crystal of montebrasite on albite and muscovite matrix. 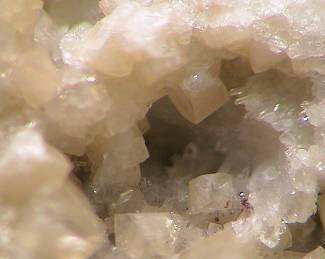 A 5 cm crystal group of muscovite crystals on albite. In the wholesale section of the show Top Gem Minerals had some interesting specimens available from the Ojuela mine in Durango, Mexico. They had a nice selection of rosasite with or without calcite and also some fine austinite specimens - some with small adamite crystals - available. I picked up specimens from each find also a few other random Mexican specimens. The Top Gem booth area open for business on the first day of the show. 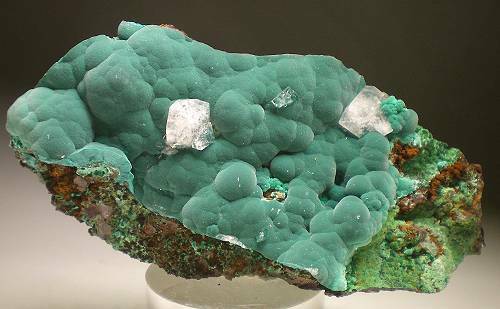 A 10 cm specimen with rosasite, calcite crystals and minor malachite. A 9 cm specimen of drusy crystalline austinite. 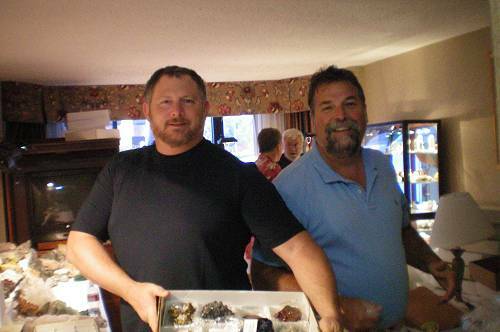 Doug and Terry Wallace of Mineral Search had a nice supply of Chinese Rhodochrosite. They had these at the Tucson Show and were big sellers for them. I passed on getting any new ones for the time being. 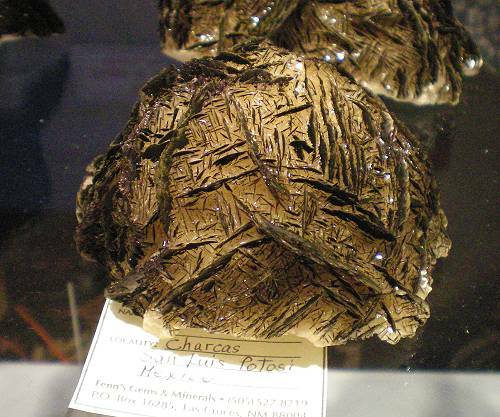 They also had some rare specimens of woodhouseite from the Champion Mine in Inyo County, California and also several chalcocite specimens from the now defunct Flambeau mine in Wisconsin. 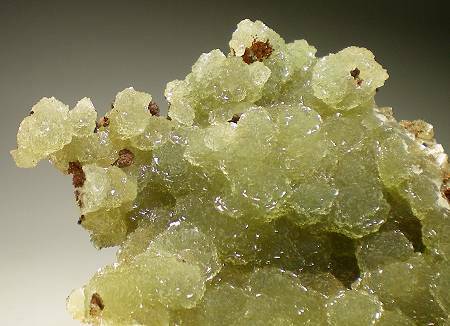 A vug with 2-3 mm crystals of the rare mineral woodhouseite from California. 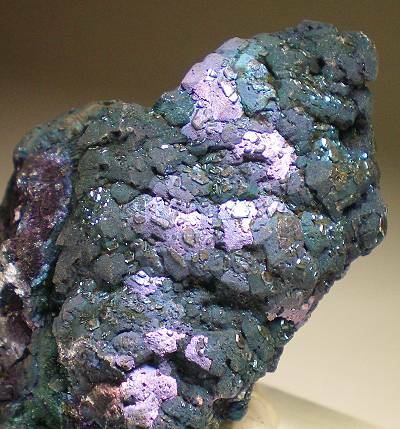 A gorgeous iridescent specimen of crystallized chalcocite 6 cm from top to bottom. I picked up a number of fine specimens including a decent number of rhodochrosite specimens from various localities and will be posting them over the next few days so stay tuned to What's New at my main site for that information. If you live in southern California this is easily the best show that is available to you during the year. Many fine restaurants are nearby and other fine and inexpensive accommodations are also nearby if you don't want to stay at the Holiday Inn. The next big show for me will be the East Coast Show in August in Massachusetts and the Southeast Show one week later in Atlanta, Georgia. Yeah baby - the east coast in August! I must be out of mind. See you then.